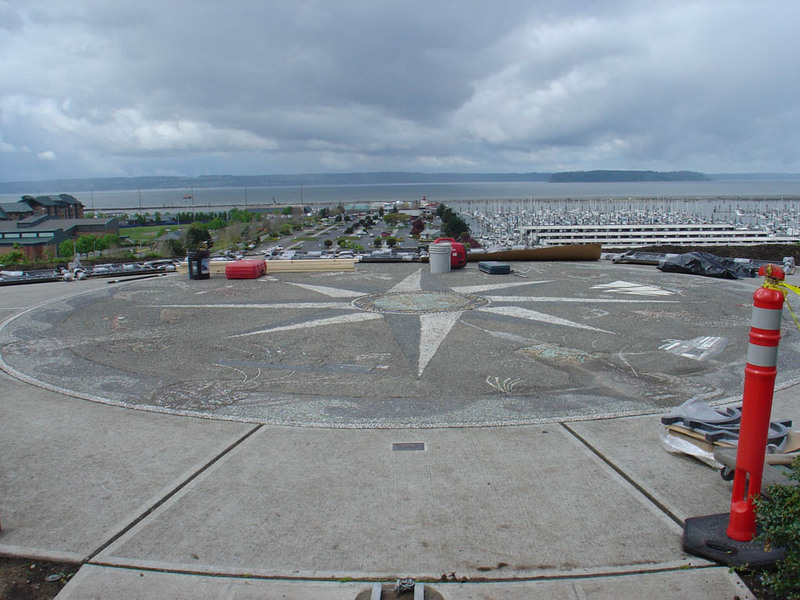 The above picture is of the viewpoint at Grand Avenue Park in Everett, Washington. I was chosen some time ago to build some railings for the scenic overlook. It is a breathtaking view of the Olympic mountains across Puget Sound (when the mountains are not shrouded in clouds). The design requirements of the project were pretty straightforward; there were to be six sections, eight feet long and 42 inches tall. The outside frame was to be 2 inch solid square for the upright ends and 1 1/2 inch solid square for the top and bottom. The thinnest any part of the infill could be was 3/4″ X 3/4″. Of course, the usual railing standard that dictated any open area must be less than a four-inch circle also applied. During several visits to the site, before I began the project, I became fascinated with the ever-changing cloud formations and how the waters of the Sound reflected the mood of the sky. It was a dramatic vista and nothing I could possibly do would be able to compete with the surroundings. My best hope was to complement the site.I had a couple other challenges that I gave myself. 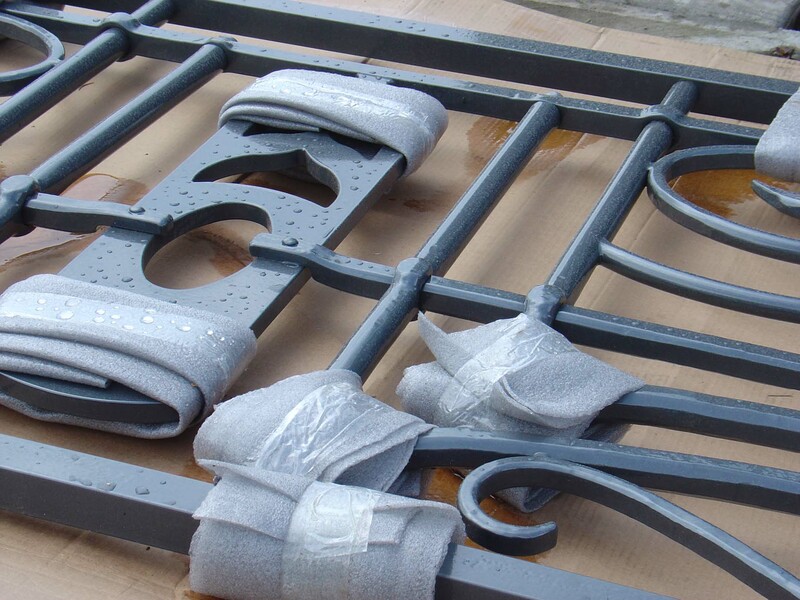 One challenge was that the railings use some type of mechanical (traditional blacksmithing) joinery. As a blacksmith, creating work for a visible public setting, it seemed like a great opportunity to give an example of work that utilized the process of forging. Another challenge I faced was that the railings, once installed, would be visible from a considerable distance below the hill. If the railings were merely 3/4″ rods, they would disappear into a blur when viewed from such a distance. I thought that they might also serve as a landmark from the bottom of the hill, in addition to being a feature at the top (where their function as railings was served). A visit to various historical archives provided some additional inspiration. I’ll let you investigate on your own to discover some of Everett’s colorful past. What I did glean from my investigation was that Everettt began as a city of optimistic promise and has a backbone founded on industry. Both of these continue to the present. It is also a relatively new city (by most of this country’s standards) and the tales of the Native Americans who lived there did not happen all that long ago. Now I was prepared to begin. Filled with the same optimistic promise as the city that commissioned these, I wanted to pay homage to the natural surroundings, the Native Americans who took care of the land before the captains of industry arrived and to capture some of the essence of all the good things that industry (and human ingenuity) can provide. I felt that keeping some evidence of hammer blows (and there are thousands in this project) would give a sense of the industrial aspect. The central component of the railings gets its inspiration from a Native American oar design and provides a central focus, a beginning to the design. My biggest concern at this point was to capture some of the delicate, ephemeral nature of the clouds and the sea below. This I hoped to accomplish through the use of broad, sweeping curves, punctuated by precise alignment of vertical elements. Doing this with 1 1/4″ forged steel would be challenging. If I were to give a title to this project, I would call it “Where Sea and Sky Meet”, for that was a theme that kept recurring throughout the process. Soon the railings will be installed. This entry was posted on Sunday, May 6th, 2012 at 1:03 pm	and tagged with blacksmithing, compass rose, Everett, forged, Grand Avenue Park, hand-forged, public art, railing, Washington, wrought iron and posted in Projects. You can follow any responses to this entry through the RSS 2.0 feed. I’m a transplant from NYC, and am always remarking about all the hand made metal work I see, both public and private, around the PNW. It’s a wonderful thing and I’m glad you’re doing it.